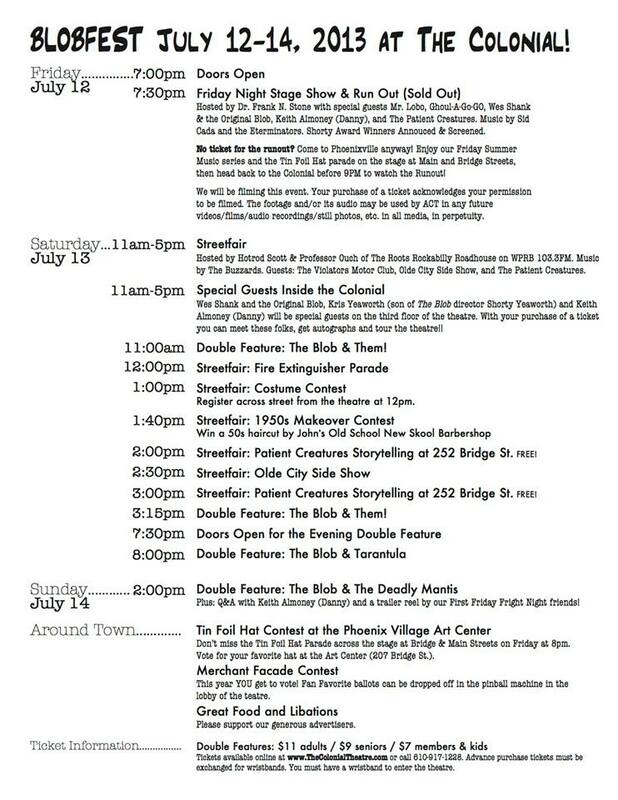 It’s just a couple of weeks until this year’s BlobFest and the Colonial Theater has released the final schedule for this year’s festivities and includes all the information you need about the Friday night Runout, Saturday’s screenings and street fair, the costume contest, the Tin Foil Hat competition at the Phoenix Village Art Center and more. Click on the image below for a larger, more readable version of the schedule below. This entry was posted on Friday, June 14th, 2013 at 4:05 pm	and is filed under BlobFest. You can follow any responses to this entry through the RSS 2.0 feed. You can leave a response, or trackback from your own site. Maxblog | Design: NET-TEC of Versicherung. Coding: ÖKO-Presseservice of Gartenlaube.